After taking a bit of a hiatus from Outdoors Father, a new project came up that got me to deal, head on, with some old tricks that had been gathering dust recently. I grew up in Israel and started my outdoors experience hiking there, mainly stumbling across the country with all the wrong gear, not enough water and poor food choices in the hope of spending the night in a great place. The last time I went hiking in Israel was more then 7 years ago, but as I’m spending part of my summer in here, I decided to try my new skills, habits and gear in this old and hostile environment. I’m planning on hiking my favourite Israeli trail in the height of summer using my ultrapacking method: 35 km days in 35°c heat. The trail is a short one, only 70 km (43.5 miles) so not a real distance challenge, but since it has been such a long time since I went hiking in Israel, especially in summer, it seems to be a reasonable endeavour. Israel is not really a very well known place for hiking, especially amongst long distance hikers, though the growing popularity of the national Israel trail (Shvil Israel) means more and more hikers are trying their luck in this diverse, culturally fascinating and hostile desert country. This could really quickly turn into a political post with too many opinions (even I have a few….) so instead of going into some background information about Israel, which would be subjective and distracting, I want to only focus on hiking and trekking in Israel. Israel is a tiny country by international standards, about 20000 sqr/km (8000 sqr/miles), roughly 424 km long (260 miles) and 114 km (70 miles) at its widest. So you can see how it is not an international hiking hotspot, but Israelis do love hiking in their tiny country, mainly to enjoy the huge diversity on such a small scale. To understand what you get in that tiny size, know that it includes: a snow clad mountain every winter (sometimes more widespread than just the one mountain, including in the Galilee), vast desert that presents sandy dunes and craggy granite sections, several fertile valleys, a few small forests and groves, areas that offer many springs year round and you can even find hot springs! As you can see, there is a lot to see while covering a pretty short distance. The diversity also presents itself in the geology, climate, fauna and flora to be found in the various regions and includes dry desolated desert to semi arid and classic Mediterranean. The flip side of such a small country is that urbanisation, housing and road infrastructure development is as aggressive as in any developing or developed country but with the juvenile (Israel is a young country) perspective about open lands. There are many national parks and nature reserves, but they are mostly tiny, highly separated and extremely underfunded. The Israeli practice of barbecuing and off roading everywhere has contributed to the deterioration and overuse of many of the open spaces despite the laws and regulations prohibiting these activities. As bad as this might sound, Israeli culture and some of the ideas of land ownership in the area means that there is a deep connection to the land and some desire to protect the open spaces. Hiking in Israel doesn’t take the form of covering distance or backpacking, but rather short day walks, car sightseeing, and an endless search for a water to dip in and cool down. Wild camping is not acceptable and in national parks and reserves it is illegal to camp outside of designated campsites. When out of national reserves you will mostly encounter land that is used, either as part of a residential community or for agriculture. It is rare to encounter open land where you can just camp – that not just next to the road, that is. 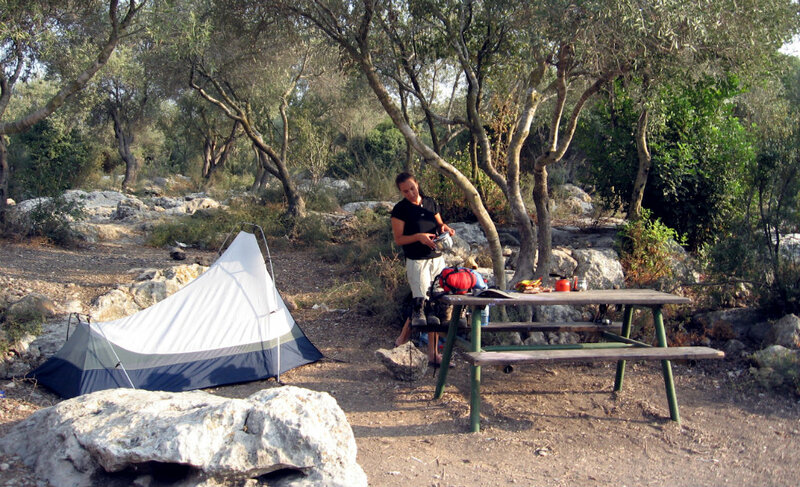 Camp sites in Israel are mostly free but you get what you pay for: there are rarely any facilities at all and one can only hope that there is a water source available. Israel’s two biggest challenges in terms of hiking are the heat and availability of water for drinking. Despite officially having four seasons, in it usually feels like Israel has 9 months of summer and 3 months of “winter”. In the peak of summer, temperatures easily reach above 35°c (95° F) and in some places will reach 50°c (120° F). Even in the winter, temperatures at altitudes below 500m rarely drop below 10°c (50° F), so as a whole Israel is very much a hot country. The result of such a hot climate is that water flow is low (no glaciers or snow melt), and the few water sources that do exist are used to feed the population and allow for normal life in the country, leaving very little water available for hikers. Public taps do exist in some camping and parking areas, but many times they are shut at the source to prevent the chance of a tap accidentally being left open and wasting water. In the last decade or so, Israel has had a constant drought that makes water restrictions, especially for hikers, more extreme. The recommended load of water per person per day in Israel, in non-winter seasons. In summer, this is a half day consumption….. The conditions above mean that hiking is very popular in the spring and autumn, mainly around the Jewish holidays of Passover and Rosh Hashana (Jewish New Year). Not only is the weather the most welcoming in spring, but water availability and trash levels (most washed away by the rain) are at their best; however this does mean joining hundreds of thousands Israelis outdoors. Trails in Israel are very clearly marked on the ground with a 3 stripe system, usually a single colour sandwiched between 2 white stripes. There are many, many trails all over the country that are usually very well maintained and are all clearly marked on the local maps. Mapping is fully covered by the Society for the Protection of Nature in Israel (SPNI) who also mark all the trails; they offer 20 different topographic maps at 1:50000 scale. Lately, smaller mapping companies have been established that offer speciality maps or smaller/bigger scale topo maps like Shvilnet. The biggest problem with mapping in Israel is that all the good quality maps are in Hebrew, so if you don’t speak the language you might have a problem. Shvil Israel has been a longtime project which I’m proud to say I was part of (by marking trails and clearing paths), and it was officially opened in 1995. The trail is about 1000 km (620 miles) and runs between Kibutz Dan in the north to Eilat Field School in the south, connecting some of the best trails in the country with a few “connecting” paths. In addition to Shvil Israel, there are many other great trails in Israel that include the Golan Trail (130 km/80 miles), Spring Valley Trail (145 km/90 miles), Yam le Yam (70 km/43.5 miles) and a few more that are in progress. Beyond the official long trails, it is possible to easily make your own route by connecting several trails, “jumping” from one to another to walk practically anywhere. As long as you are on a marked trail, you can freely walk without being stopped or having your access blocked. For a while now I have been thinking of making a trail that will connect my favourite areas through the Galilee, Jordan Valley, Gilboa mountain, Izra’el Valley and Carmel mountain; one day I might find the time to test this idea. Despite living in England for the last 6 years, travelling for a total of almost 2 years in other countries before that and being a generally lazy teenager, I have spent more than my share of days and nights outdoors in Israel. My family was not a hiking family, but more of a “seeking a water source for swimming and barbecuing” kind of a family; so I didn’t do much hiking until I was a teenager. After a not-at-all-outdoorsy start as a computer loving teenager (back in the floppy disk times), I joined a youth movement and ended being an outdoors and trail guide and counsellor. 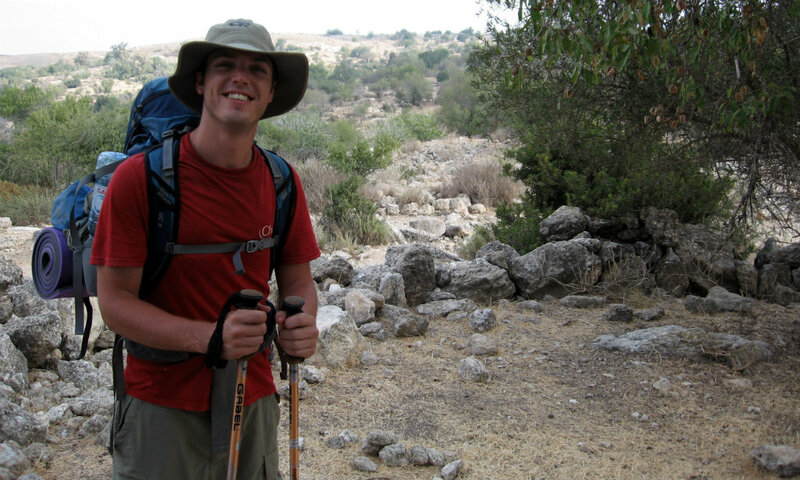 Me, hiking in Israel, back in the days…. By my late teens I reached the point of skipping school regularly to spend time outdoors, making my own way with friends or organising trips and camps for hundreds of kids in my youth movement. My outdoors skills were rubbish, based mainly on instinct and trial and error, while my gear was only marginally better than you might expect from someone in biblical times: mainly sandals, clunky boots at times, huge bags with no carrying system and a sleeping bag the size of my torso. Despite all that, we had a great time being outdoors, no matter the season, searching for secret springs and pools to swim in while having a coffee and relaxing. Hiking in Israel is very much influenced by the Bedouin nomads and Arabic sheep herders so high tech gear and pre-planning has never been part of the adventure; maps were a hypothetical possibility and we never carried enough water but still found enough to cook some Turkish style coffee. Hiking in Israel is never complete without some coffee! By the time I left Israel in 2010, I had covered almost all the trails in Israel, walked every part of Shvil Israel (though never in one go) and most of the longer trails. I had dragged my wife (who was girlfriend back then) on trips in the scorching heat, across the desert or in the midst of unexpectedly wet winters (wetter than usual, that is). Either with friends, groups I was guiding, or as part of my army experience, I criss-crossed Israel on my feet. After all that, I do recommend hiking in Israel, seeing as how 4 days of hiking will take you through such different environments, climates and cultures. And don’t forget that the food is excellent! In the coming weeks I will be writing more about my trip and some of the skills that come in handy when hiking in a hot climate in the summer.